It's not every day you get an email from number 10 Downing Street. In fact, I'm impressed that Gordon Brown found the time to email me on only his second full day in office. The email was the government's response to an e-petition I had signed asking: "We the undersigned petition the Prime Minister to make it illegal to indoctrinate or define children by religion before the age of 16." Predictably, the response includes the usual (easily rebutted) nonsense about the contribution of religious education to the moral development of pupils and the need to show respect for other faiths, but it also confirms that the government "respects the right of parents to raise their children in accordance with their own faith". Apologies to all who have tried to access Family Lore over the last couple of days, only to find an advert for my domain host, or a 404 error, but I've been transferring the blog over to my new domain. I knew it would take a while, but it took much longer than it should, due to my ineptitude. Many thanks to Martin George for his technical help - without him you'd still be looking at that advert. In yet another example of the absurdities caused by the complete inflexibility of the child support system, barrister Michael Cox was jailed yesterday for non-payment, despite his ex-wife pleading with the court not to jail him because she would then be forced to give up work and go onto benefits. Cox owes £43,000 to the CSA but is refusing to pay because his three sons spend half of their time with him and accordingly, he argues, he should not be treated as an absent parent. Cox apparently gives legal advice to fathers' rights group Fathers 4 Justice, who believe he has been made a scapegoat because of his involvement with them. They state: "In effect he has become a political prisoner jailed by the CSA in a secret court for discharging all his responsibilities to his children - He has become a Guantanamo Dad". No need to excuse the language, bloodyrelations is a new family law blog by barrister Jacqui Gilliatt of 4 Brick Court. "Where there's a bloody relative...", says Jacqui, "there seems to be someone to have a good fight with if my post bag is anything to go by". Too true. Jacqui is also developing a family law wiki, familylawfaqs, which looks like it could become an extremely useful resource to family lawyers and their clients alike. Providing "for the media not to attend family court proceedings as of right, but to apply to attend on a case by case basis". Time will tell whether these proposals, if implemented, will be sufficient to appease those calling for change (I doubt it), but I certainly agree that not letting the media in as of right must be in the best interests of children. In the process of collecting materials to support my point where judges should be allowed to make law, I have come across your article “Judge-Made Law” posted on 3rd May 2007 in your blog, familylawsolicitor.blogspot.com. Hence, I would kindly appreciate if you could state your opinion on the issue – “Should judges be allowed to make law?” clearly in your reply and provide valid reasons. Thanks for your precious time." Wow, one heck of an email to receive on a Sunday morning! The title of the post to which Ng refers was my little homage to law students, most of whom, it seems, are required to answer some version of this tricky question by sadistic law tutors. I may have over twenty years experience in the law, but I'm not sure that I'm qualified to provide an answer. Nevertheless, here goes. The first thing I would say is that it seems to me that the question is academic (in both senses), particularly in any common-law based system: who but judges can 'fill the gaps' left by statute-based law? I can understand the argument that all law should be made by the (democratically elected) government, but that can surely only ever be a pipe dream. It is utterly impossible for any government to create a complete system of law, covering every conceivable situation in every conceivable area. Inevitably, there will be gaps, either (more rarely now) where there is no statute law at all, or where the application of statute law to a given situation has to be interpreted. If judges don't fill these gaps what do we do, stop the court proceedings and refer the matter back to parliament? The best-known example of the 'interpretation' gap in English family law is section 25 of the Matrimonial Causes Act, where the guidance given to courts deciding how to divide assets on divorce amounts to little more than a checklist of factors to be taken into account (this is what Jeremy Posnansky QC was referring to in the post mentioned above) - only in recent years have the courts 'imposed' a starting-point of equality. Here I have to agree that such a fundamental point should surely be determined by parliament, but parliament has thus far chosen not do so. More learned lawyers than me will no doubt cringe at the answer I have given above. Nevertheless, I hope this helps you Ng, and good luck with your studies - just ask someone else next time! Islamic protests against Salman Rushdie's knighthood continue apace, a story that has attracted comment on other blawgs such as Belle de Jure and Charon QC. I agree entirely with those comments. I have not read The Satanic Verses, but I have read other books by Rushdie, including the wonderful Midnight's Children, so I have no problem with his literary achievements being recognised, but that is not the point. Contrarily, I disagree with the anachronistic British honours system, but that is not the point either. The point is that no one should be required to do or not to do a thing just because of someone else's beliefs. If people want to hold a religious belief (and I use the word 'want' purposely - I think many want to believe despite what their rational mind is telling them), then that is a matter for them and them alone, and if they are offended by what the rest of us do then that is their problem, not ours. Despite this government's best efforts, we are still lucky enough to live in a society with freedom of speech and thought, unlike the wretches in fundamentalist Islamic republics, and we must defend that right by refusing to give undeserved respect (to use the words of Richard Dawkins) to religion. I'm sure the public's response to the logo will be similar to its response to C-MEC. With reference to this post, it came as no surprise to me that Denise Rowley lost her case against the CSA in the Court of Appeal. She intends to appeal to the House of Lords, but I don't hold out much hope. It is appalling that parents and children can have no recompense for the severe hardship they have suffered as a result of the failure of a government body to do its job. For an example of this hardship and an eloquent criticism of the system I recommend reading Lisa's comment to my previous post. 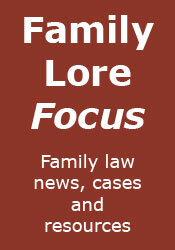 I've finally gotten around to giving Family Lore its own domain name. Luckily, the one I wanted was still available, despite my procrastination, so now visitors can come here via www.familylore.co.uk, which is somewhat more relevant and easier to remember than http://familylawsolicitor.blogspot.com! Thanks to Family Law Week for pointing out this article about Sharia Law in Britain, particularly its use for resolving marriage disputes. 1. The use of Sharia Law is not always purely voluntary. Many parties will be pressurised by their families to submit to its 'jurisdiction'. 2. As with all religious texts, there are widely differing interpretations of the 'Islamic law', as pointed out in the article, making its use a lottery. 3. Use of an alternate system of law can show a lack of respect for the real law. 4. Like 'faith schools', the use of a religious system of law perpetuates segregation on the basis of religion, when we should be promoting integration. 5. Increased use of Sharia law is bound to give rise to calls for its decisions to be recognised by English law - something which is obviously wrong, but which may be increasingly difficult to resist, especially in these politically correct times. The government is intending to push forward with plans to make the registration of fathers' names on birth certificates compulsory, once safeguards to protect vulnerable women and children can be put in place. The rationale behind the plans seems to have two elements: firstly to encourage fathers to play an active role in the child's life and secondly to make it easier to pursue them for child maintenance. All of this sounds great, but what of the situation where the mother names the wrong father, out of malice or mistake? Does this shift the burden of proof to him, to show that he is not the father? And even if the correct father is named by the mother, the father does not thereby acquire parental responsibility unless the mother agrees to him jointly registering the birth with her. As for child maintenance, does the fact that the mother has registered the father's name make any difference? She will give his name anyway to the CSA (or its successor), and is having his name on the child's birth certificate going to encourage a recalcitrant father to pay? Still, at least, as Kate Stanley says, the child will know who to send a card to today. You have found your way to the site that will help you help yourself. A site that assists in keeping you from committing another cruelty upon yourself. Consider the experiences to date that have brought you to this point. Your quest: to be correct, satisfy a woman's demands, societal pressures, and keeping her in house and home, have now driven you from yours. The opportunity before you is to purchase a talisman that serves as both a deterrent and a solution to your momentary lapse in judgment. Too often divorce today is about property, lifestyle and spending money. Recent huge settlements have focused on the trivial and the dishonourable – who gets what, how lavish was the lifestyle, how greedy are the claimants. Such cases overlook the real damage of divorce: the hurt of the children, their loss of opportunity and the breakdown in parental relationships. I mentioned the publication of the Child Maintenance and Other Payments Bill in a post last week. I've now had a chance to look at it. There are a number of provisions that I will no doubt comment upon in due course, but for now I'll concentrate upon the proposed new basis for calculating maintenance liability. Instead of the old basis of the net income of the non-resident parent (NRP), it is proposed that in future gross income should be used - see section 16 and Schedule 4. The aim here seems to be to reduce the opportunities for that parent to 'play with the figures', and also to speed up assessment. This seems to me to be a very sensible proposal (I never thought I'd hear myself saying that), although whether it will result in unfairness to the paying parent remains to be seen, particularly where he or she has high pension contributions (which are currently taken into account when calculating net income). Of course, using gross figures will mean that the percentages of income to be paid will have to be reduced. The 'basic rate' figures change from 15% to 12% for one qualifying child, from 20% to 16% for two and from 25% to 19% for three. The rates reduce still further (to 9%, 12% and 15%) if the NRP's gross weekly income exceeds £800, presumably to take into account higher rates of income tax. I've made some rough calculations and it seems to me that the new percentages will result in higher maintenance liability than under the present scheme, even assuming no pension contributions are paid by the NRP. If I'm right, then many NRP's are in for an anxious wait to see if the Bill makes it on to the statute book. 1. For the parents to remain on as good terms as possible with one another. This is where the approach taken by solicitors is so important. An aggressive approach is obviously likely to cause positions to become even more entrenched. Consider therefore instructing a solicitor who is a member of one of the panels, or a member of Resolution. Such solicitors should adopt a constructive and non-confrontational approach, putting the best interests of the children first. 2. For all arrangements regarding the children, particularly contact, to be agreed. Unfortunately, this isn't always possible, but every reasonable effort should be made. Again, the approach of the solicitors instructed will be important, but in the end they are limited by their client's instructions, so the parents must keep asking themselves: 'am I taking this position in the best interests of my child, or because of my feelings towards the other parent?' Consideration should also be given to the use of mediation. The 'Morton's Musings' column in the Gazette is often an entertaining read. This week, the subject takes us back to the time prior to the Divorce Reform Act 1857, and in particular to the wonderfully named offence of 'criminal conversation' (adultery to you and me), whereby the cuckolded husband sued his wife's seducer for damages. Morton recalls the sad but hilarious facts of one of the last actions for the offence, in the case of Lyle v Herbert. Recommended reading, especially if you're an old-fashioned family lawyer yearning for 'the good old days' (which I hasten to add I'm not!). BBC News today includes a story about a Chinese couple in their 80s who for the last few years have only communicated with one another via written notes. I have to report that this sort of behaviour is not at all uncommon, even with couples of this age, although in this country the situation would usually be brought to an end sooner, by divorce. The messages are then transposed on to solicitors' notepaper, and the expense of this is normally enough to persuade the parties to resolve matters by agreement. According to the BBC the Child Support Agency is today sending out over 100 letters to parents requesting their permission to name their former partner on the CSA's website, that partner having failed to pay child support. Whether this will actually have any effect remains to be seen - I can imagine the first tranche of 'shamed names' will attract a lot of publicity which may put some pressure on those people, but how often will the names be viewed after that? The Child Maintenance and Other Payments Bill, setting out the government's reforms to child support, is also to be published. Will this create an effective replacement for the CSA, or will it be another shambles? More on that later, but don't hold your breath. I've posted previously (see e.g. here) about the increase in shared residence arrangements, whether ordered by the court or agreed between the parents. In this month's Family Law solicitor advocate David Burrows, that tireless champion of the less well off (and highly entertaining speaker) points out how the benefits system has failed to keep up with this development. As he states, the system assumes that only one parent can care for a child and thus receive benefits or tax credits. This is clearly discriminatory against the other parent (usually the father) and, as Ward LJ pointed out in a recent case (quoted by Burrows): "justifiably fuels the passions of protesting fathers". This obviously needs to be addressed, and preferably, as Burrows suggests, by changing the rules throughout the tax credits and benefits system, rather than by leaving it to parents to 'pick off' each tax credit and benefit, one by one, through the tribunals/courts system. "Last year more than two-thirds of lawyers saw an increase in demand for pre-nuptial agreements, said business advisers Grant Thornton's." So reported BBC News yesterday. However, a word of warning to any wealthy spouse-to-be: pre-nuptial agreements are not (yet) legally binding in this country. As Mark Harper, solicitor for John Charman, put it: "Any client who comes to me wanting a prenup who is concerned about protecting their assets, the advice I give has to be they shouldn't get married." As if to confirm my post from a couple of days ago, various media reports have been published today using the term 'quickie divorce', referring to the divorce of DJ Chris Evans and actress Billie Piper, including ITV News, the Daily Mirror and the Daily Record. Once again I repeat that the procedure they used was no different from the procedure used in any other divorce. The only reason that it has been 'quick' is that the divorce was not defended. So the moral is: if you want a quick divorce, agree everything beforehand.